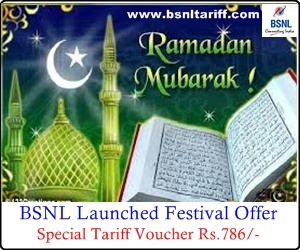 Leading Telecom Operator in India Bharat Sanchar Nigam Limited (BSNL) has launched new Special Tariff Voucher of Rs.786/- on occasion of Eve Ramazan under GSM Prepaid Mobile Services across Tamilnadu Telecom Circle for limited period 90 days as promotional basis. The Competent Authority of BSNL Tamilnadu Telecom Circle has introduced new Special Tariff Voucher (STV) of Rs.786/- for Ramazan Festival season which offers, Full usage value equal to MRP i.e Rs.786 and Free Local/National SMS to Any Network 786 Numbers with validity for 90 days. New Special Tariff Voucher (STV) of Rs.786/- will be applicable to all prepaid palns available in Tamilnadu Telecom Circle (Including Chennai Telephone District) for limited period as promotional basis.